Amarilli vezzosa ‑ often known as Il duello amoroso) and a goddess and a mortal man. This last contest is depicted in Gasparini's Io che dal terzo ciel, but what contest there is seems to be more in the nature of Venus and Adonis trying to outdo each other in expressions of mutual affection. Before heading off to Venice (where he was, in effect, Vivaldi's boss at the Ospedale della pieta), Gasparini had been an active participant as violinist and composer at these gatherings, and this cantata perfectly encapsulates the ideals of the Arcadian Academy. Its opening harp solo (magically played by Frances Kelly) evokes an appropriately pastoral setting, while the pure, limpid tones of Anna Dennis, bathed in an ethereal radiance and coupled with a lovely feel for the musical shape and an effortless delivery of Gasparini's weightless lines, seems the ideal musical representation of the goddess Venus. Her adoring lover, Adonis, is the splendid countertenor Andrew Radley and when he confesses that 'my human face, compared to your beauty, is like the humble atom that is more beautiful when the sun gilds it with its rays', one can only assume that the sun was simply blazing down on his vocal chords when the recording was made. Vocally, he is the perfect Adonis; adorable and poised, pure in tone but strong in delivery. In the Handel cantata these two singers have a more dramatic, not to say fiery, encounter. Dennis, removed from her goddess's throne, has all the biting arrogance of the proud Amaryllis, while Radley induces pity and contempt in equal measure with his dewy‑eyed and hapless shepherd, Daliso. The Handel/Scarlati contest is depicted by two keyboard works which both open with an identical theme; the difference between them highlighted by Julian Perkins' decision to play the Handel Sonata (HWV;79) on the harpsichord (in two different versions) and the Scarlatti Sonata (Kk63) on the organ. 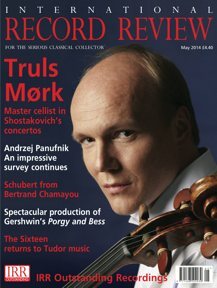 Perkins certainly draws attention to both the improvisatory and virtuoso elements in these pieces with performances of great energy, but his own booklet notes remind us that these contests were not merely concerned with virtuoso display but also with the ability to move the emotions of the listeners. He proves his point with an intensely beautiful performance of the Scarlatti Sonata in D minor (Kk32). the cello of Jonathan Rees joins in with equal virtuosity and enthusiasm, while all three players are egged on eagerly by the continuo team of James Akers and Perkins. This is a lovely disc, ingeniously programmed and lovingly performed by some outstanding musicians. The booklet essays are superb, while the recording is a model of clarity and warmth. As such it makes an ideal tribute to the late Noelle Barker, whose death, following the release of the first 'Conversazion I', clearly robbed these players of a wonderful guiding light; 'a formidable teacher and a refreshingly honest friend', as the printed tribute puts it.